With a title like that this race has quite a billing to live up to. And it does. It’s a New York cult classic – and for the past few years the opening race in the New York Road Runners (NYRR) club race series. 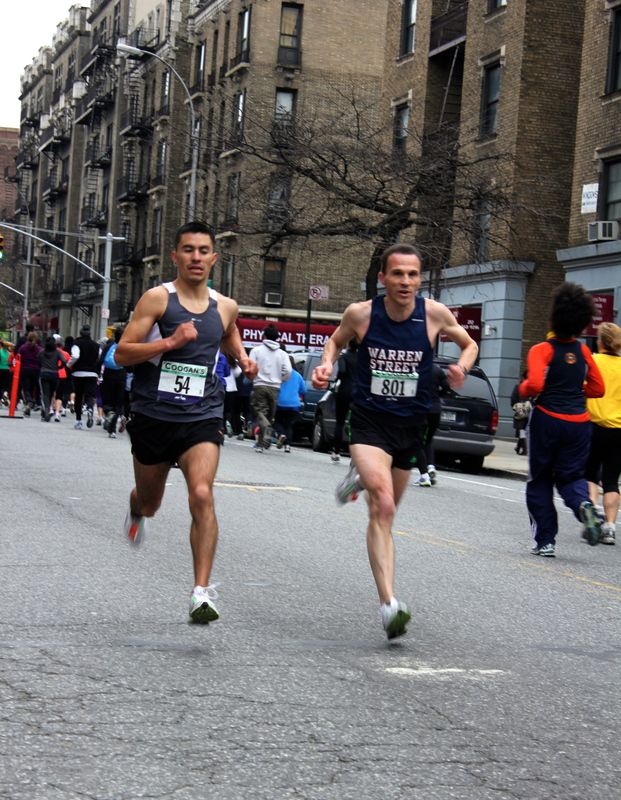 One of the few NYRR races held outside of Central Park, it threads through the northern Manhattan neighborhood of Washington Heights. 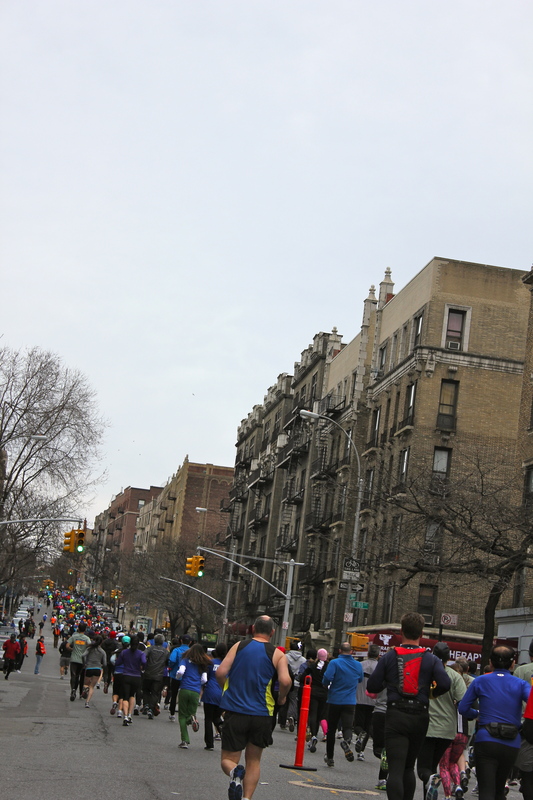 Runners heading up the first hill in Washington Heights. The race is a microcosm of New York: 5000 runners ranging from Ethiopians at the sharp-end to fancy dress at the back; entertainment ranging from bagpipes and marching band through to salsa and blues; and a melting pot of spectators lining the streets from Irish to Dominican. Standing on the start line the emcee reminded us that the area was steeped in history – the course passes by the site of Battle of Fort Washington, fought during the American Revolution. So how fitting that just before the gun there was a rendition of the Star-Spangled Banner, the national anthem of the U.S.A.. Then we were off. This out and back course is perhaps the toughest of all NYRR races. It takes in the hills of the northern tip of Manhattan. By the first mile, which I covered in 5:07, you’ve crested two hills. You then descend into Fort Tyron Park. At this point I think I heard “A Hard Day’s Night” bellowing out from the sidewalk. It was barely 9:06am and it was already proving to be a hard day. Just before the 2 mile point, with the clock reading 10:18, I passed by a female marching band. I had to admire how they braved cold winds in skirts shorter than my shorts. Cresting the last hill at 2.5 miles it’s then a long downhill straight into the finish. I could see a long thin line of runners in front of me including team mate Sebastien B. (on track to a 15:44 PR). The finishing line teases you. You see it from half a mile away but it gets closer much too slowly. I jousted with Emiliano Garcia, originally from Mexico now based in Queens, and an occasional training partner, as I passed three miles in 15:32. He edged me by a second as I crossed the line 28th in 16:02, bagging top age grade with 89.1%. Paul and Emiliano going head-to-head near on the way to the finish line. Within a few minutes there was a melee of runners in the finishing area sharing stories and feasting on free green bagels (St. Patrick’s Day is next week). The results (see here for NYRR pictures and story) revealed Warren Street Social and Athletic Club to be second men’s masters team and fifth men’s open team. The Coogan’s experience does not end on the finish line. Post race several hundred runners squeeze into Coogan’s Restaurant to enjoy free Guinness, Shepherd’s Pie and unlimited and intoxicating running camaraderie. Two hours later Shamala and I were on the 1 train heading home to Peekskill. The New York running scene has it all. And more. 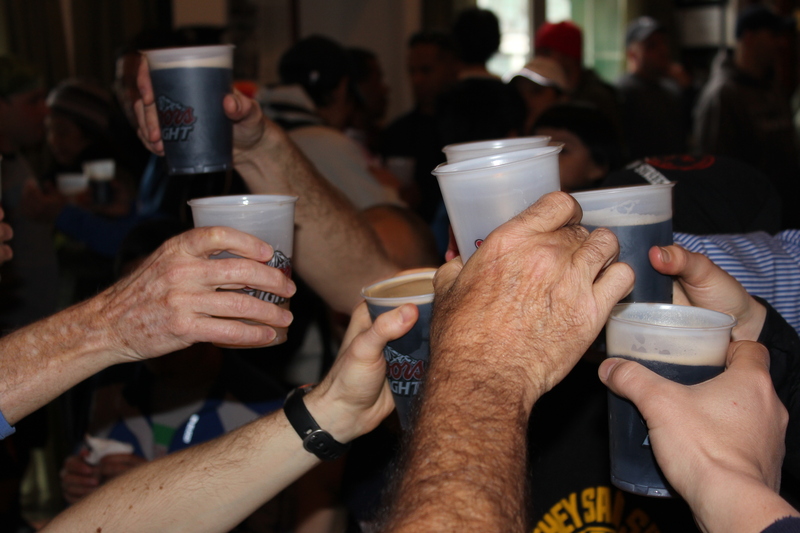 Guinness and camaraderie make for a heady post-race mix. This entry was posted in Running and tagged Coogans Salsa Blues and Shamrock 5K, NYRR, race report, Warren Street Social and Athletic Club. Bookmark the permalink.